Save up to $400 on Stressless Recliners during the 2016 Charity Promotion. Now is a terrific time to help yourself and help others. Ekornes is proud to offer your favorite Stressless Recliner and Furniture models at steep discounts for 55 days this Holiday Season. We do our best to deliver comfort and relaxation to our friends and family throughout the year. During this time of year, we like to take a special moment to appreciate those things and make an effort to give back to those who are less fortunate. When you make a $50 donation to a charitable organization, you receive an instant discount and 100% of your donation goes directly to charity. This promotion begins on November 23rd, 2016 and applies to all eligible orders placed through January 16, 2017. 1. Make a $50 donation to charity and save $200 instantly on any Ekornes or Stressless Furniture Item. 2. Make a $50 donation to charity and save $400 instantly on any Stressless Mayfair Recliner or Office Chair. 1. 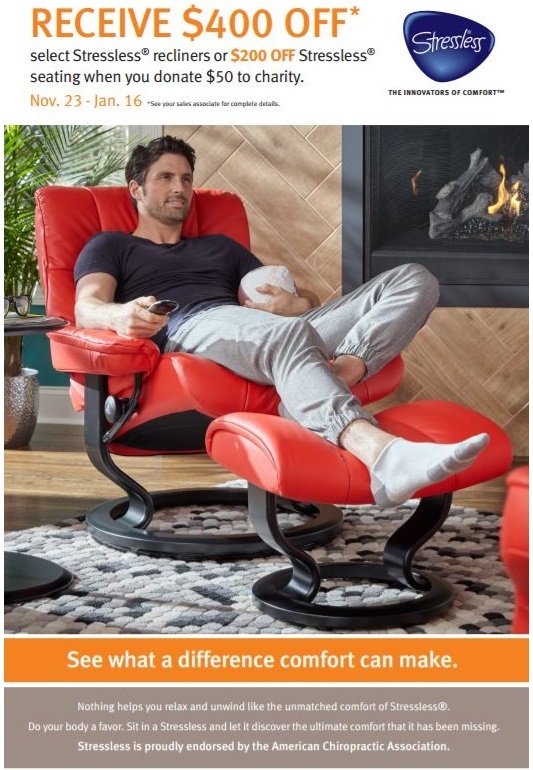 Visit your preferred Stressless Recliner or Ekornes Furniture product page. 2. Choose a Fabric or Leather Color from the colored swatches on the right-hand side of the screen. 3. Your Discounted Charity Promotion Price will be automatically reflected at the top of the page. 4. Don't forget to make a wood stain selection, when applicable. 5. Click the "Add to Shopping Bag" Button. 6. Then visit the Donation Item page: $50 Charitable Donation Page and add this item to your "Shopping Bag". 6. If you would prefer to donate to a different charity or a local organization, simply make a note in your order stating "I will mail in a check or proof of donation." 7. Now: Sit back, relax, and our team will have your order delivered right to your home as quickly as possible. Remember, when you choose The Unwind Company, you are making the choice to go with the folks carrying an A+ Rating with the Better Business Bureau. You are choosing dedicated relaxation specialists who diligently provide the lowest prices allowed on our healthy furniture and relaxation items. You are getting the best prices and the best values, period. We do our very best to provide a Stress-Free Shopping Experience for each and every one of our friends and customers. We treat you like family. We truly appreciate your orders and your spirit of philanthropy during this holiday season. The Unwind Company has selected The Society of St. Andrew as their charity of choice for this promotion. If you would like to donate to The Society during this promotion, simply add the $50 Donation item to your cart. Any and all donations are welcome. The Society helps rescue fresh fruits and vegetables from fields that would otherwise go to waste. They deliver this "gleaned produce" to local hunger relief agencies across the United States. In 2015, The Society helped rescue and distribute more than 85 million servings of food to those who need it most. They are on track to exceed that goal this year. This organization holds a special place in the heart of The Unwind Company because they not only prevent wasted food but they also feed people. More than 96% of every dollar donated to The Society of St. Andrew goes directly to the mission of feeding the hungry. The Society is able to provide each serving of food at nearly 2.8¢ per serving. This means your $50 donation provides 1,800 servings of food to those in need. There is no other hunger relief agency that can deliver food at that low of a cost. There is no greater "Seasons Greetings" than a gift to someone in need, at this time of year, than fresh food. At this time, I also feel it's important to note that 100% of your donations will be going directly to the charity specified. If you have any questions about donating, ordering or how to get your proof of donation for tax deduction purposes, don't hesitate to contact us. Please also feel free to contact us if you would like more information about The Society of St. Andrew and how it is fighting hunger across the nation. It is our pleasure to assist you fully and completely. You can email us at: customerservice@unwind.com or call us at 888-486-9463 Monday through Saturday 8am-5pm CST. Our Customer Support Team will be more than happy to answer any and all questions. If you have any additional questions or would like to discuss this article, leave a comment. I will happily get back to you as quickly as possible. Until next time... Stay comfortable my friends!